A historic moment in aviation? A manned plane powered by conventional batteries took off from Tokyo on Sunday - and flew for 59 seconds. The one-man, glider-like plane took off from a private airport and reached a height of 5.2m (16ft). It was powered by 160 AA batteries, which are commonly used in portable CD players and cameras. "I was careful at take-off as it was very difficult," said pilot Tomohiro Kamiya, a senior member at the Tokyo Institute of Technology. He added: "As it soared 5m, people on the ground looked so small to me. "I did not expect it to take off so beautifully. I realised again how powerful it could be." 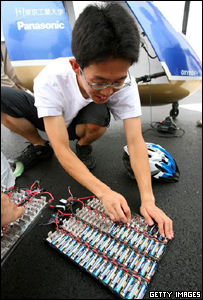 The Institute, known for its experiments with human-powered planes, and Matsushita, who provided the batteries, launched a joint project to develop the battery-powered vehicle in January. In April, the joint team completed building the plane and suceeded in rolling and taxiing the aircraft in its first test flight. In the second test, the plane soared 2m above the ground and flew some 400m "almost independently". Sunday's flight was the first in the presence of officials from the Japan Aeronautic Association.